When you live in a city as densely populated as New York, clashing with the neighbors might as well be included in the terms of your lease. Of all the myriad reasons to hurl expletives at the charmless miscreant across the street, though, unreasonable noise is definitely in the top three -- and now there's an interactive map to prove it. 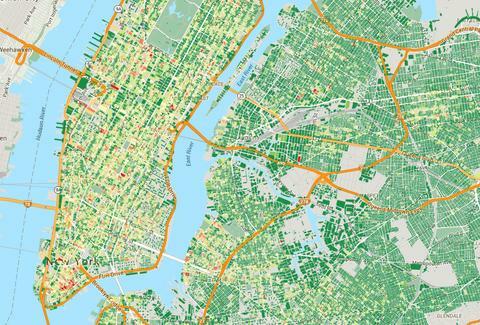 Place I Live, a site based around providing location-based neighborhood info, compiled the noise complaint map below using 311 service request data obtained through the NYC Open Data platform. The map drills down to show the complaint levels of each neighborhood's individual buildings, and the densely packed isle of Manhattan seems to outpace the rest of the boroughs pretty handily with especially noisy 'hoods at its northern and southern extremities. Then again, it could just be that the folks in Queens, Brooklyn, and the Bronx are exposed to the same level of noise, but simply aren't reporting it to the city. Staten Island's crypt-like silence seems about right, though.